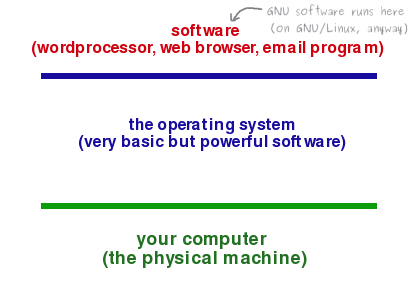 Linux is an operating system for your computer. 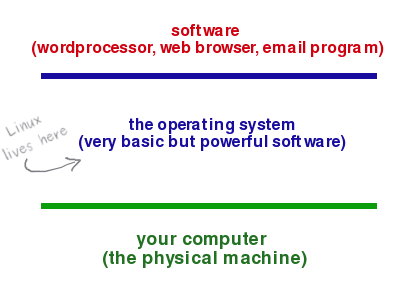 Like the Mac and Windows systems, it provides the basic computer services needed for someone to do things with a computer. 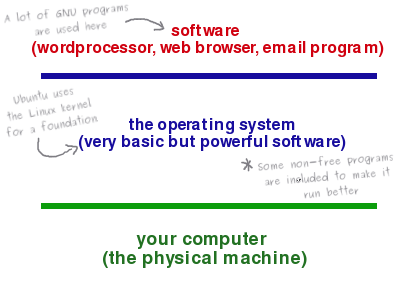 It is the middle layer between the computer hardware and the software applications you run. Full applications have capabilities like boldface type and picture editing tools. None of this is available through the operating system. Yet all of it is done by communicating with the machinery of the computer through the operating system. You may highlight a word in your wordprocessor and tell it that you want that word in bold type, but the operating system tells the computer which pixels (or part of the screen) to darken. Linux was developed by Linus Torvalds and a band of programmers who voluntarily developed the core program of the system (aka, the kernel). That program was originally compatible for another operating system called Minix, but later development made it usable with GNU software. GNU is pronounced like the animal and stands for 'GNU's Not Unix.' It was a project conceived by Richard Stallman in 1983 in response to the increasing tendency of software companies to copyright their software under terms that prohibited sharing. GNU's purpose: to develop a wholly free system. It had achieved significant progress toward this goal by the time that Linus and others had developed their kernel in the 1990s. While many people refer to the combination of the two as "Linux", this is not wholly correct. The kernel combined with GNU's free software is properly called "GNU/Linux." Both the kernel and the software are freely available under licencing that is sometimes called "copyleft" (as opposed to copyright). Where traditional copyright was meant to restrict usage and ownership of a copyrighted item to as few people as possible, inhibiting development and growth, GNU/Linux is different. It is released under terms designed to ensure that as many people as possible are allowed to receive, use, share, and modify the software. That licence is called the GPL (GNU Public Licence). Ubuntu depends on the Linux kernel and includes many GNU applications. So, when someone speaks of the Ubuntu kernel for a computer, they are actually talking about a recent version of the Linux kernel. Most of the applications that are available for Ubuntu are either part of the GNU collection or are released under the GPL.